As the picture says, updates resume on Monday, October 6th! All patreon supporters can head over to their activity feed to see the next 4 updates: 1 cover page and 3 pages. 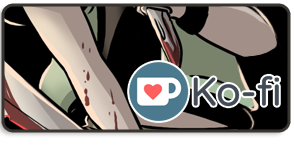 As you wait for updates, please go check out the SpiderForest comic of the Week, Supervillainous! This comic is created by Zappit, and any fan of the humorous anti-hero will greatly enjoy. A story told from the perspective of a supervillain, explosions, minions dying left and right...! It is just so difficult to find good minions these days. Here's a recent one that made me splurt tea on my monitor at work. Read it! Enjoy! Spread the word! Some random news: I was interviewed about the art club I started at Upstate, where I am a student. People are always surprised for some reason that I in fact do not look like Colbey, so here is some photographic evidence! Had an awesome time talking about things I'm passionate about: art, science, life. EDIIIIIITTT! Can't believe I forgot! A second interview you can go check out was just posted by Daniel Sharp of The Demon Archives. Daniel is an MD/PhD student (like myself), and he's the writer of this post-apocalyptic badass comic you should be reading. Seriously, go read it, you know you want to. Not like there'll be any updates here for another week! You have time. You can see the interview here! And that's a wrap for this chapter, folks! This new Mega is pleased to make your acquaintance. Her name is Sarrah Duval. There will be a break in pages for a week, and updates will resume on October 6th, with the next chapter: The Whizard and the King. Of course if you're a Patron, you can see pages earlier! The cover page is up with more pages to follow this week. 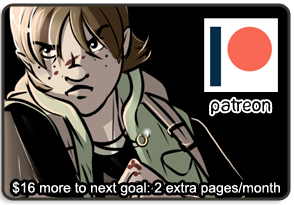 Today's vote incentive is a head shot of Colbey drawn with Emily Rose as a reference. Personally, I think that Emily Rose (from Haven), with short brown hair, could make a pretty awesome Colbey.